As I make final preparations for a return trip to the Burning River 100, I have given much thought to this in all essence selfish endeavor that I will be taking part in. Last year, I had somehow convinced my wife, and a couple of friends who I had run with before to follow me along the course. Without them, there is no way that I would have finished. To motivate me along the way in training, I further took a step that was tentative in nature and began putting out a podcast to chronicle my attempt at covering 100 miles. Normally, a private person, I thought others might want to know what it took just a regular guy, a father and a husband with a job to train and do the race. I never expected and still have trouble comprehending the fact that not only did people listen to me ramble on, but this year, when I put out that my BHAG was to return to Burning River and try and go under 24 hours that fellow runners (Gordon, Mark, Megan, and Eric), whom I have never even met and are spread out across the country would volunteer for this experience. I could offer no air fare, gas, or accommodations. However, if it all worked out and they showed up that they would be part of a crew helping me in this selfish endeavor. Where else but in this community of athletes? The road this year to the starting line has been filled some roadblocks and potholes along the way, but through it all, this community of athletes (yes, we are all athletes, whether you run, ride, swim, walk, etc) has been encouraging, helpful, and inspirational along the way. This weekend, I will be doing nothing special in the landscape of ultras. There are participants that have done many 100 milers, and people that this year have done Western States, Badwater, and now are doing Burning River. I am simply going out there with the goal of moving forward all day and with the support of my crew and YOU, I will complete my selfish goal. Thank you in advance for all of your support. This is a community unlike any other. Dirrty Girl and I were able to sneak in one more hike during our time in the Smokies, and it was the NewFound Gap to Charles Bunion route. An out and back 8 miler, it climbed quickly from the parking lot and Dirrty Girl put her new Vasque Blur SL GTX trail shoes to the test. At about 3 miles in, we were able to check out the Icewater Spring Shelter. Charles Bunion is a rock out cropping and just a short spur trail off the AT. The sign below indicated that Dirrty Girl was going to have face one of her fears: heights. 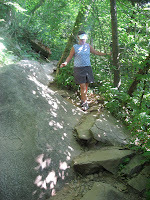 Cheezy pic, yes, but I am up on the rock out cropping while that was as far as Dirrty Girl was willing to travel. View from atop Charles Bunion. If I had a bucket list, a thru hike of the Appalachian Trail would be on it. 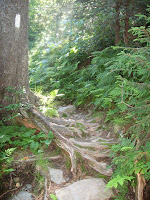 The Appalachian Trail is a 2,178 mile marked hiking trail between Springer Mountain in Georgia and extending all the way to Mount Katahdin, Maine. Originally, when talks began about heading to the Smokies this summer for a family vacation, I was really excited about the opportunity to hop on the AT and log a few miles. Enter, Randy McCarter . Randy who listened to the podcast and heard that we were headed this way offered up a route and to see if I would be interested in running/hiking this section with him. Absolutely!! My own research into which sections to hit had been not so much and to have a local willing to show me the AT was a great idea. Funny, when Randy and I met early one morning to drive up the mountain, he admitted that even though he had lived here for most of his life, that he had never been on the AT. Well, at least we had a buddy system to hit the trail, and we drove up the mountain to drop one car at Clingman's Dome and then back down the mountain to start our foray @ Newfound Gap. If I have learned anything from my visits to National Parks, it is to start early! Even at 7 am, the parking lot was like a ghost town, but upon our return several hours later, it would be like the frenzy at an after thanksgiving early morning sale. From Newfound Gap to Clingman's Dome was just under 8 miles and took us approximately 2 hours and 40 min to complete. The trail was filled with many sections like this below. The motto was simply to run when we could and hike the rest. Randy was a great companion and I certainly would look forward to hitting the trail again with him. Although, you pop out on the trail at the highest point of the AT, there is this walkway thingy that you can go up to get views like the one below. The best way to describe my intial experience on the Appalachian Trail is this: ruggedly beautiful. Located just outside of the town of Berea, Kentucky, the Berea Forest Trail was the sight of a nice hike for Dirrty Girl and I to begin our foray onto the trails of the South. Our destination for the next couple of days are the Smokies, but this was for our legs to say hello to some real hills. We were greeted at the trailhead by a muttly mutt, who bore a dog tag reading: "Hi, My name is Tillie. I am not a stray. I live at the house next door. Let's go for a hike." Tillie, did not make the trek with us, but was waiting when we got done to roll over, get a scratch, and thank us for coming.